The first of April has long been a day for practical jokes and silly pranks -- and there's no escape from April fools on the internet. Companies like ThinkGeek regularly announce fake products on April 1st, only to have customer demand push those jokes into production. It didn't take long for companies to start using the prankster's holiday as a soft test bed for silly ideas. That's how Hyperkin announced the SmartBoy -- a gamepad case that lets your smartphone play real Nintendo Game Boy cartridges. Two years later and Hyperkin's ridiculous April Fool's gag is actually a real product -- and, believe it or not, it's actually pretty cool. 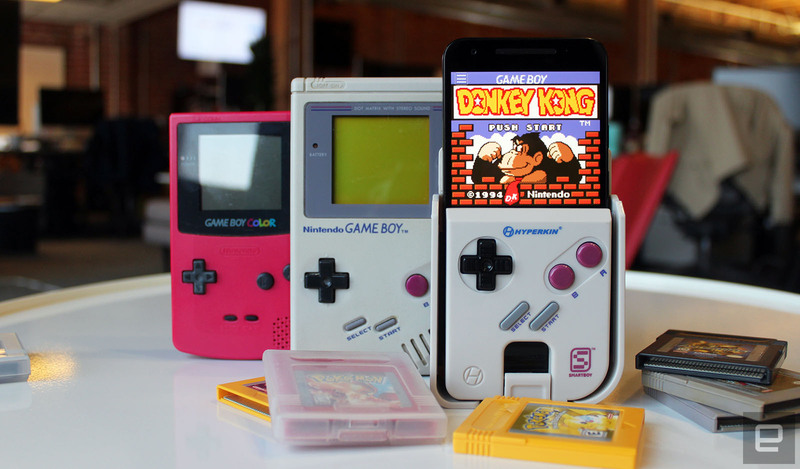 The final SmartBoy doesn't stray far from the original April Fool's design: The case is essentially the bottom half of a Game Boy that wraps around your smartphone -- leaving about half of the phone's screen visible for gameplay. On the front, it has the same familiar layout as Nintendo's handheld: two face buttons, a D-pad and start and select toggles. The back side of the SmartBoy has a physical cartridge slot flanked by L and R buttons. Below the cartridge slot, there's one more toggle -- a button that lets users adjust the width of the case to fit larger phones. It's a great concept -- just drop your phone in a Game Boy–shaped case, insert your favorite game cartridge and start playing. Execution, however, is a little bit more complicated. Before getting started, you'll need to download both the SmartBoy Serial app and MyOldBoy, a preexisting Game Boy emulator. 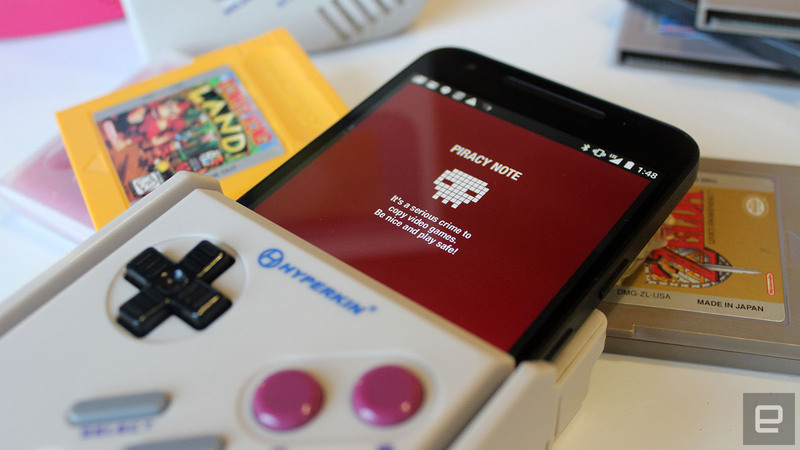 The SmartBoy doesn't technically play your games directly from the cartridge, either -- you'll need to wait for the serial app to download a copy of the game to your phone's memory and then manually open it using the emulator's file manager. The first time you do this, it can feel a little complicated, but it gets easier. MyOldBoy remembers what folder you were using last, and the SmartBoy app can be configured to launch as soon as you plug your phone into the case. After everything is set up, the process is fairly straightforward: plug in your phone, download the game, tap the screen to launch the emulator and play. Once you get everything up and running, the SmartBoy becomes a wonderfully nostalgic way to play classic Game Boy games. The ridiculously large case mimics the feel of Nintendo's original oversize gaming portable -- though how wide it is depends on the size of your phone. It's a little thicker than the original Game Boy, but that served my now adult-size hands just fine. The buttons feel a little more clicky than the originals, but they still feel great overall. It's the smartphone aspect, however, that makes the experience potentially better than picking up your original Game Boy. The screen of a modern phone is just leagues ahead of the display on any of Nintendo's handhelds. Games are presented on a larger, backlit screen with louder audio than the original Game Boy's single mono speaker could ever hope to offer. 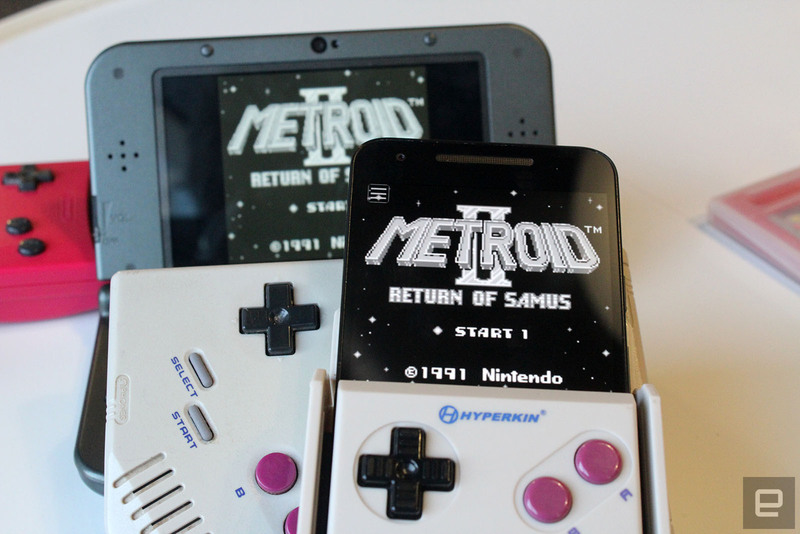 It can be even better than the 3DS' virtual console: on my Nexus 5X, games were sharper and brighter and had deeper blacks than the same titles played on Nintendo's hardware. Better still, some games even had extra features: The SmartBoy plays Donkey Kong in full color, as if it were being played on a Super Game Boy ---- but on the 3DS the game is presented only in black and white. Although the SmartBoy is designed to work primarily with Game Boy and Game Boy Color games, it's also compatible with Game Boy Advance emulators. That explains the extra shoulder buttons. The SmartBoy looks good. It feels right. It triggered the nostalgic feeling I want out of playing classic Game Boy games without tainting the experience with the original hardware's drawbacks. That said, the SmartBoy has its own quirks to deal with. First, it's compatible only with devices that use USB Type-C connectors, meaning iPhones and older Android device owners are out of luck. The case also blocked my Nexus 5X's headphone jack, making Bluetooth my only personal audio option. It's also a little picky about cartridges. Only Game Boy and Game Boy Color cartridges are compatible right now. Hyperkin says it might add Game Boy Advance support in the future, but the experience just isn't good enough yet -- apparently it takes the SmartBoy up to five minutes to load GBA games. That wouldn't be so bad if you only had to do it once, but the app deletes any dumped ROMs as soon as the user removes his or her phone from the controller, and it displays an anti-piracy warning if you pull the cartridge out midgame. That doesn't mean you can't use the SmartBoy to play Game Boy Advance games; it just means you'll have to download them from the internet. That's kind of a legal gray area. I also had a little bit of trouble with the cartridge-dumping process. My copy of Wario Land: Super Mario Land 3 runs fine on my old Game Boy, but I just couldn't get it to run from the SmartBoy. Stranger still, downloading a ROM of the game from the internet works just fine. My copy of the game is probably just old and dirty -- but it's the kind of hiccup that can happen if you don't keep your games clean. The fact that it relies on an existing Game Boy emulator is a minor issue too. The free version of MyOldBoy will play any game you throw at it, but some of its features are locked behind a paywall. 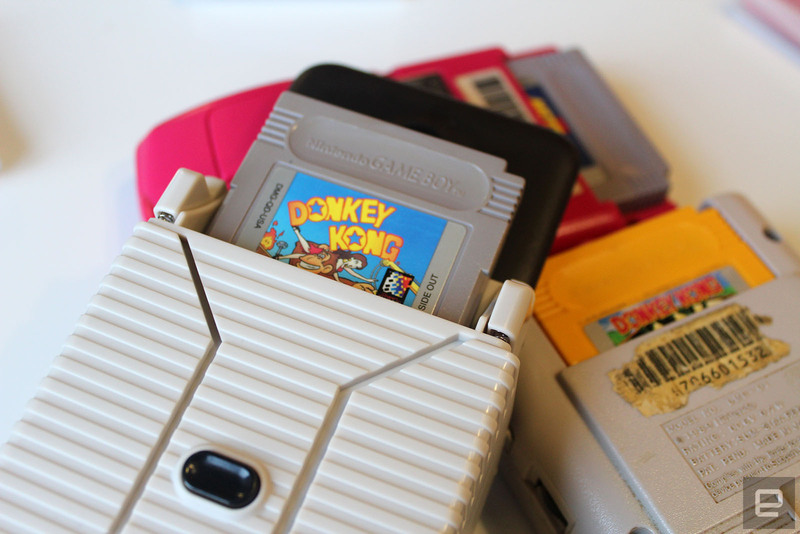 If you want access to save states or cheat codes, Game Boy Camera emulation or full link-cable emulation for multiplayer games, you'll need to pony up an additional $4 for the full version of the app. For some, the SmartBoy might seem like a silly, cumbersome product (and it is), but it's also a fun, nostalgic and tactilely satisfying way to experience old Game Boy games. Sure, if you're comfortable living in a legal gray area, you could just download old games from the internet and play them with any Android-compatible gamepad -- but there's something satisfying about picking up a game cartridge and playing the old-fashioned way.